Sir Cliff Richard and Nigel & Lesley Birch, partners of Adega do Cantor, hosted a Charity Event on the 4"' of August 2014 at the Quinta do Miradouro in Guia from 530 pm until 8 pm. The SUONIAMO an Italian youth Orchestra played light classical pieces with a special performance by Sir Cliff Richard. All proceeds went to the The Peta Birch Community Association. Read the article by The Portugal News. The children of the Santa Casa will be the receipients of all proceeds made from the "swim for shoes" during the festive season. Diary dates - two opportunities to SWIM FOR SHOES where you can have a dip in the Atlantic Ocean and help to raise money for children here who are in need of new shoes. 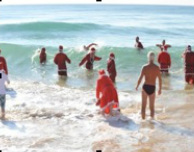 These will be on Christmas Day and New Years Day at 11.00 a.m. on the beach at Armação de Pêra in front of the Holiday Inn Algarve (formerly the Hotel Garbe). Adults and children are all welcome to take part on the understanding that you do so at your own risk. If you have family and friends staying over the festive season it will certainly be something different to do! Download the PDF flyer in English and Portuguese. We have been selected as one of the receipient charities for the November 30 Xmas fair at the Colégio Internacional de Vilamoura. Please join us! On December 1, 2013 at the Hotel Forte do Vale from 1-4 p.m. please bring a present to drop at the Xmas tree for the children at the Pirilampos and Gaivota homes. Thanks to KISS FM for choosing our association as the recipient charity. Come along for live broadcasting and entertainment. The annual charity fundraiser was held on September 21, 2013 to support local charities and charitable associations in the Algarve. The Peta Birch Community Association was selected as one of the recipient charities. Read more about the event here. 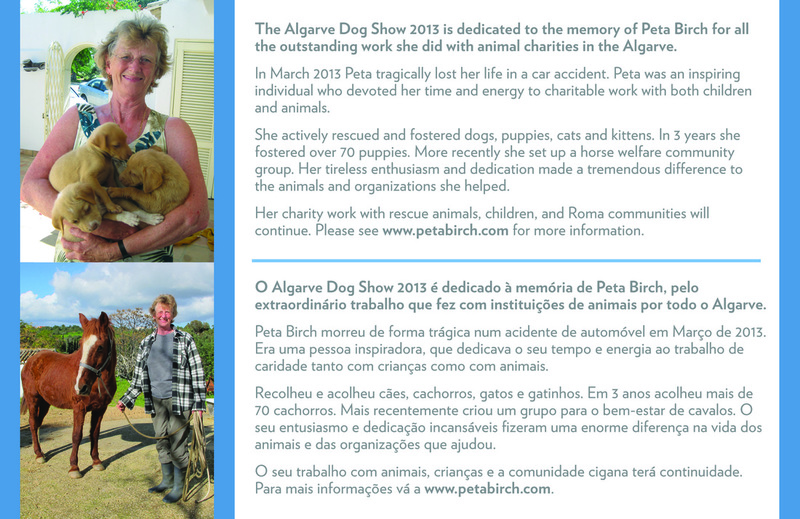 The Algarve Dog Show 2013 on June 1-2, 2013 was dedicated to the memory of Peta Birch for all the outstanding work she did with animal charities in the Algarve. Visit the Facebook page. The Colégio Internacional de Vilamoura kindly donated all proceeds of their cake sale on May 31, 2013 to the Peta Birch Community Association.